Director Online articles usually address specific technical questions, but every now and then someone asks a design question, like: "What is the best tool to use for designing a multimedia CD?" While it would be nice to say that there's a single program that can do everything and is easy to use, unfortunately that's not the case. When designing and creating a multimedia project for CD-ROMs, there are several programs you can use with each having their own pros and cons. Believe it or not, some people do all of their design completely within Director. It has the built-in abilities to create simple bitmaps and vector shapes, along with both aliased and anti-aliased text. However, its design tools aren't the most extensive in the world, so most people will find that they need other tools to go along with Director. If you're creating a prototype or some simple administration tools, then Director might have everything you need. And if you want to add a little pizzazz without purchasing other expensive design tools, then there are several third-party components such as StatMedia's Transparencies which provide design solutions for Director, so you can also consider using those. Director's younger sibling Flash, is also a great application for designing. It's not only a powerful tool for designing sites and animations, but also an intelligent and creative multimedia tool. Flash is the best when it comes to animating vector art. Its ability to create tiny file sizes with a lot of animation, has resulted in a deep saturation on the web. Many sites, cartoons, animations, banners and ecards are created using this tool it's a wonder to find sites without it. The benefits to using Flash are that it can create small file sizes, and that you can also add some interactivity, too. This allows you to do some of your programming outside of Director which may speed up development time. Flash isn't just limited to vector art though. It also contains a powerful Trace Bitmap tool, allowing a clean convergence to vector art. You can have fun importing your Photoshop files, or After Effect PICT exports into Flash and perhaps giving it a vectorized twist. The biggest reason not to use Flash as a design tool is that it doesn't have any real tools available for manipulating or changing bitmaps. It's a visual drawing tool rather than a bitmap editing tool. Photoshop is the ultimate graphics program. It can open, modify, and export just about any kind of bitmap graphic file format. There are also hundreds of third party plug-ins and filters available that let you easily create just about any kind of visual effect you want. Also, Photoshop has many capabilities built into it for developing print projects. So if your CD-ROM is going to have packaging, it might make sense to design all of your project's design components within Photoshop. One reason you might not want to use Photoshop on a project is that it's a pretty expensive program, so if you're starting up in the multimedia world, it can be hard to justify the expense especially when there are cheaper alternatives out there. Fireworks, the image editing tool from Macromedia, is becoming a more popular choice for designing multimedia. It has many features built in for designing web pages, and it also has a nice combination of both drawing tools and image editing tools. The best part about using Fireworks is that it comes packaged with the Director Shockwave Studio, so you've already got a decent design tool right out of the box. Also, Macromedia has a free Xtra available called the Fireworks Import Xtra which allows you to easily include Fireworks cast members inside your project. So which design tool is best for you? It really depends on the look and feel you want to create. Below you will see two real-life examples of multimedia projects along with how they were designed, and maybe this will help you figure out what you need on your program. The art for this game was created in both Illustrator and Photoshop and is a mix of vector and non-vector art. 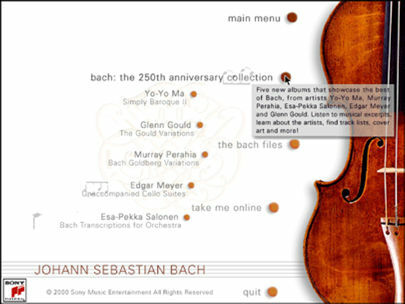 The images of Bach, which animate revealing either a smile or a frown, were created in Photoshop. 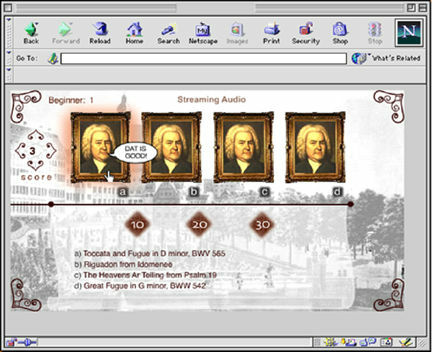 Bach's face was manipulated in Photoshop using layers to reveal the smile. Each PICT was then exported and imported into Flash. The background is a mix of vector and PICTs and png's producing a more textured look and feel and shows a good example of use of various tools. The client for this project wanted a heavy textured look with a lot of depth and transparency. These kind of graphic effects are harder to replicate using Flash and Director's built-in tools, so I decided to create a single background in Photoshop and export that flat image to Flash. Then, Flash was used to insert the dynamic text across the middle containing the answer to the quiz questions. This project was made for a CD-ROM, based in Director. In this instance, the art elements were created in Photoshop, however the overall layout and finished design was completed using Director. The reason I chose these specific design tools is that the look for this project was elegant text on a white background. By rendering all of the text from within Director, it made it much easier down the road if the client wanted to make a text change. Then we could just go into Director and make the change, as opposed to going into Photoshop and making the change there. I have given two examples here - one created for the Internet, the other for an enhanced CD. However this does not necessarily mean that Director is the best for CD and Flash for the Internet. The design tool you should choose to use for your project really depends on a combination of factors such as your project's requirements, the type of visual design you want to create, and what you want the overall user experience to be. Only after seriously considering all three of these things together can you determine which design tools are the "best" ones to use. ¬†Victoria Grujicic has been working on GUIs, animations and sites for Sony Music Entertainment for almost three years. Her background in Art, Video, Motion Graphics as well as all things Web-based have defined her as quite the Digital Artist. She still enjoys to dabble in programming of all sorts, other dabblings include her most fave: life drawing, experimental video and simply enjoying life in one of the most creative and inspiring cities in the world, NYC baby!